Sheets of foamed polystyrene for insulation of houses. Insulation is needed to keep a colony warm and reduces the consumption of energy for heating. 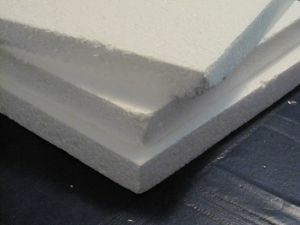 Aerogel or plastic foam may be utilized for insulation. Regolith may be heaped over buildings to keep in heat. Mineral wools, spun from local resources, may provide a lower tech alternative insulation. Fiberglass, a type of mineral wool, is commonly used as insulation on Earth. Arsenic is a mineral that can be used as a heat tolerant insulation, but is toxic to life. 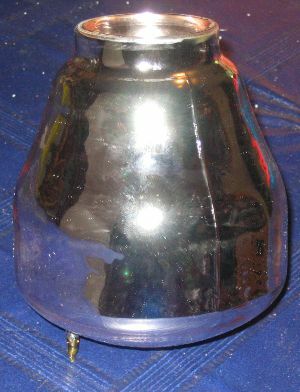 The glass body of a vacuum flask. The thin Martian atmosphere has a reduced capability for a convective flow of heat. More important is the heat radiation, which can be effectively reduced by choosing the material of the building's surface. A smooth bright metallic surface emits much less heat radiation than a rough black one. A simple aluminium coated foil wrapped around the settlement modules provides excellent insulation. 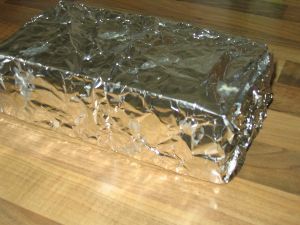 Multi-layer insulation of the same type of foil can reduce heat loss to very low numbers and is commonly used for satellites. Foam glass is another form or insulation than can be produced locally and should have superior insulation properties,as well as good structural properties. A block of ice wrapped in aluminium foil to prevent melting. 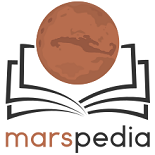 Insulation of fuel tanks on Mars may be a requirement to prevent accumulation of frozen CO2 on tanks. CO2 freezes a little bellow -67C and could accumulate significant mass on a fuel tank. What is the heat transfer coefficient of regolith, aerogel and other materials? What can be produced in-situ with low energy consumption?